The first row is the before pics. And the last row is how they looked when all the work was done. Mari (4yr old) - Has a hatred for hair and having her hair done. She screams and hollers until I want to cut all my hair off. 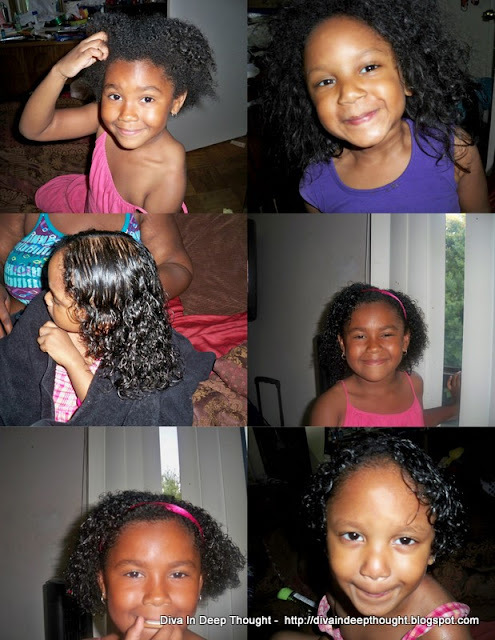 Yaz (6yr old) - Loves her hair, and although it is thick and curly, she still wants to wear it out. I texterized her hair (trust me, I had no other choice) and then trimmed some dead ends. She is estatic. Now as for me, when I preparing for my pre-anniversary day of errands(its tomorrow), I decided that pink would be an awesome way to say… I Love You! As it is one of my favorite colors (seriously I have so many, who can keep up) but I just wanted to look nice. We didn’t go anywhere special, but I could tell that hubby was happy & proud to be with me everywhere we went. Also, I felt so pretty… and that’s what really counts. We all deserve pretty days like today, I have to admit I'm blessed with a kinda high confidence so my “unpretty” days are few and far between. But today was different, I felt… aglow… does that make sense? Have you ever had a day where pretty just didn’t seem to fully express how great you feel? Eye Base: 1st - a thin coat of Motives eye base, 2nd - another coat of MAC Groundwork. Sooo hate creases.